I’m pretty sure my new neighbors think I’m a lesbian. They haven’t said anything to me directly but there have been whispers, apparently, that my dad overheard when he was on my front porch and in a neighborhood like this, news travels very quickly from one stoop to the next. It probably doesn’t help that my college roommate came to visit the weekend before last. And, since I don’t have a proper guest bedroom yet, that we both spent the night in my bed. And that I didn’t have curtains installed at the time. And that my bedroom faces the street. Oh well. Soon The European will return as we will set the record straight. I actually warned him, via email, that I was going to require copious and conspicuous amounts of… you know. Surprisingly enough, he has not yet responded to my request. I’m left wondering if he has A) died of a heart attack in the interim, or B) is reconsidering his regard for a woman who says such ridiculous things via email. Prior to The European’s departure, I was perusing his bookshelves as I do quite often at his house. The majority of his books are in other languages and most of them are non-fiction so I was pleasantly surprised to find a novel—in English!—that I’d not come across before. 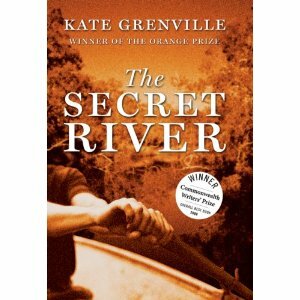 It was called “The Secret River” by Australian author Kate Grenville and he let me borrow it. I finished it in less than two days and fell into a nice, deep depression afterward thinking about how terribly the industrialized nations of the world have treated the various “indigenous” peoples they’re encountered. The European approaches almost everything he does with great intensity, even novels about nineteenth-century British convicts who get transported to Australia, so he had underlined a good portion of the book. He apologized for this before giving it to me but I found it endearing. It took me a while to figure out his pattern—what was he underlining, and why?—but eventually I cracked the code: it was the rhetoric of “civilization.” The attempts of the protagonist to “tame” the land, his wife’s futile attempts at keeping the inside of their dirt hit “clean,” the fencing off of “their” territory, the delineations, the dichotomies of indoor vs. outdoor, wilderness vs. civilization, “Christian” vs. “heathen,” and so on. I thought immediately about my new bedroom. I took the door off a while back with the intent of repainting it; this has not yet happened. But the curtain situation has in fact been rectified, and I feel all the safer for it, not just from the prying eyes of my nosy neighbors who think my college roommate and I are somehow involved but from the rest of the world in general. And isn’t this just ever so slightly strange? Writing Wednesday: To Blog Anonymously or Under Your Real Name? Are You a Vacuum or a Washing Machine? Or, you could do like Cory Booker who, when asked to comment on the fact that some people thought he was gay, replied that he didn’t mind because he didn’t want anyone voting for him because he was straight. You can truly live up to your generation’s progressive ideals (very different from the world that your parents grew up in) by not caring whether they think that or not. I am glad you are curtained. How did the neighbors get all that from two women being close and interacting? Sheesh. It’s a very close knit neighborhood and from what I can tell, it’s very prone to gossip.